During the Viking Age (which lasted for about four hundred years, namely between the 8th century and the late 11th century), Scandinavia was fragmented into various petty kingdoms which were each ruled by a local earl (or jarl). Thus, this large land area situated in Northern Europe, which collectively represented the homeland of the Norsemen, was subject to a relentless series of internal skirmishes or large scale wars between most of the neighboring Norse kingdoms. Consequently, the Norsemen, motivated by a considerable number of reasons, commenced a campaign of expansion into most of Western Europe. The Vikings who had raided and settled parts of modern day France or Britain were mainly of Norwegian and Danish descent, but to smaller extent also Swedish. The Vikings were an important part of the Norse society, but it is an erroneous statement to ascribe them for all early medieval Scandinavians. ‘Viking‘ was the designation of an occupation, not of a people. Bearing in mind this thing, when ‘Viking’ is referenced in this article, it is synonymous to either the term ‘explorer’, ‘warrior’, ‘merchant’ or ‘settler’. Thanks to the ship-crafting technology made for constructing the highly reputed longships, the Danish and Norwegian Vikings would usually explore, settle and raid territories located westward, while the Swedish Vikings would do the very same in the east. It is quite easy to discern why the Swedish Vikings tended to look on the east with considerable larger interest than in the west, particularly because of their geographic position. When taking a short glance at a map, one does clearly realise the fact that most of the coastline of Sweden has access to the Baltic Sea, rather than to the North Sea. In this respect, a wide range of opportunities expected the Swedish Vikings after they explored the coastline of the Baltic Sea, from modern day Sweden all the way towards present day Finland or Estonia, as well as significant parts of present day northern Poland. Extensive settlement of the east side of the Baltic Sea was done in the 9th century. Subsequently on through their voyages, the Swedish Vikings traded along the great rivers of modern day Russia and Ukraine, ensuring powerful economic links with native Scandinavia. But neither Russia nor Ukraine represented the limits. 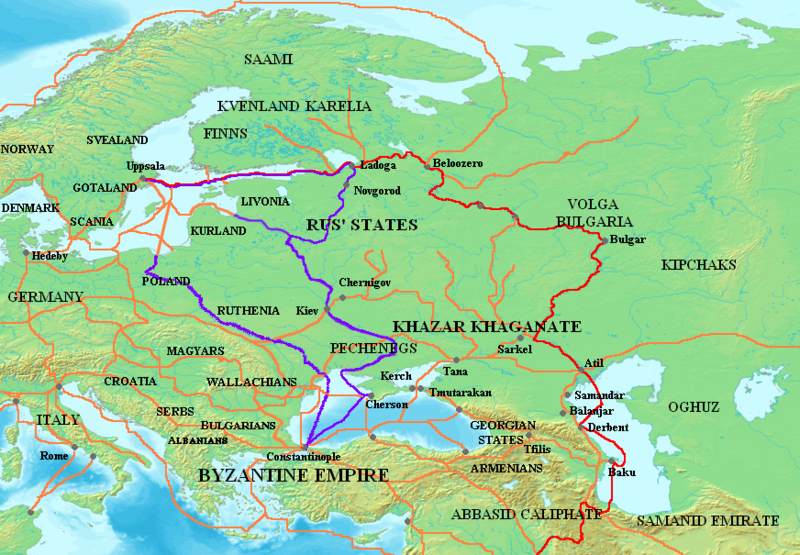 They reached both the Black Sea and the Caspian Sea, and traveled as far south as the Byzantine Empire. Many of the goods which stemmed from the commerce with Eastern European polities were transported to a noteworthy economic centre in Viking Age Scandinavia, specifically Birka, located in the proximity of modern day Stockholm. They became merchants in the early medieval principalities of Poland, Ukraine and Russia, and in fact considerably influenced or formed the basis of the aforementioned Slavic states as we know them today. It is known that the first waves of Swedish Vikings who had colonised Ukraine and Russia came there as early as the 8th century. From several early medieval manuscripts, such as the ‘Tale of Past Years‘ or the ‘Chronicles of Novgorod‘, the Swedish Vikings are noted to have created the basis of Novgorod under the leadership of a man known as Rurik. The succeeding leaders to the throne of Novgorod, Helge (or Oleg) and Ingvar (or Igor), conquered much of present day Ukraine and established the Kievan Rus’, where they had introduced the Orthodoxy as state church. It is also very important to mention that the Swedish Vikings were referred to as ‘Rus’ by the East Slavic populations and the Greeks. The etymology of the term ‘Rus’ can be explained via the Finnish and Estonian words for Sweden — ‘Ruotsi’, and ‘Rootsi’ respectively — which in turn are derived from the Old Norse ‘rods-‘, meaning ‘those who row’, clearly implying the navigational skills of the Norsemen. The Rus’ people lived, according to the ‘Tale of Past Years’ (or the ‘Primary Chronicle’), along with the Swedes and the Gutes in the southeastern part of the Scandinavian peninsula. They were initially expelled from Novgorod, but subsequently invited to rule over the Slavic and Finnic tribes that inhabited the respective area. Thus, it’s safe to conclude that due to the relative geographic proximity, the Rus’ people were actually the descendants of the Swedish Vikings/The Rurik Dynasty who had expanded the Kievan Rus’ by conquering more land in Eastern Europe. Apart from their main occupation of tradesmen, the Swedish Vikings were also renowned warriors, having served as the personal guard of the Byzantine Emperor in the Varangian Guard. The several states that together initially formed the Kievan Rus’ were referred to as ‘Garðaríki’ in Old Norse (according to the sagas), and some of them had access to the Black Sea. At first, the Swedish Vikings besieged Constantinople in 860, but had eventually been bought off with significant terms of trade and enrolled as the mercenaries which mostly formed the Varangian Guard of the Byzantine Empire, which existed from the 10th century to the 14th century. The Varangian Guard was the elite military unit of Byzantium, consisting in the beginning of Norsemen (that includes not only Swedes, but also Norwegians, Danes, and Icelanders) and Rus’. The Rus’ were the first to be conscripted in the Varangian Guard as early as 874. 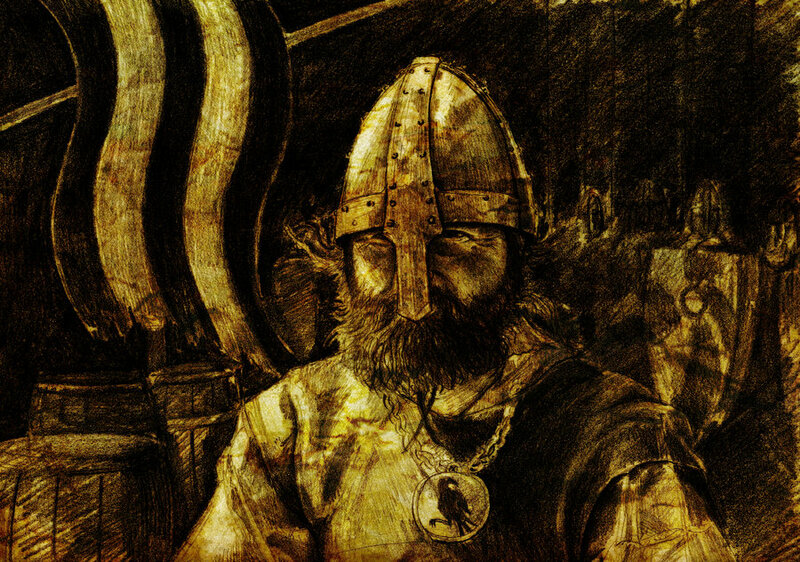 Until the late part of the 11th century, this military elite organisation was predominantly based upon Norse principles. Nonetheless, as the 11th century came to an end and the 12th century progressed, the Byzantine Emperor Alexis Kommenos recruited mainly Anglo-Saxons. In conclusion, the role of the Swedish Vikings in Eastern Europe is far more important than some would believe (i.e. solely traders and pirates), and so their legacy is present in the very formation of some of the Eastern European states as well as in the Byzantine Empire. The first map is not accurate. The first known Swedish settlements in the coast of Finland are from 13th century, definitely not from Viking age.